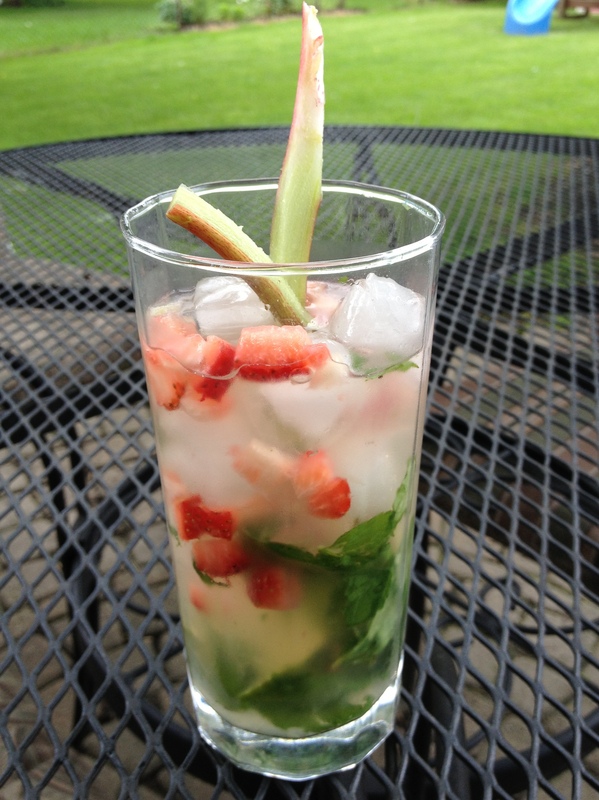 Many strawberries and limes were harmed in the making of this post! Several stalks of rhubarb were chopped. Mint leaves were muddled. Rum was slugged. All in the name of summer fun! First you must make your rhubarb simple syrup. I recommend doing this a few hours ahead of time so it can chill. But what did *I* do? I set up an ice bath with two metal bowls and ice water in between, so I could cool off the simple syrup A.S.A.P. Planning ahead is awesome, but I wanted a cocktail! What does muddle mean? In my house, it means smash around with a wooden spoon. My neighborhood BFF, Melissa, has a fancy mortar and pestle mojito doogie. Basically, you want to smoosh the juice out of the lime, release the oil from the zest, and bruise the mint leaves. Add 2 ounces white rum. Add ½ cup club soda.